Hello lovely people. Today's card is for the second challenge over at Loll and Bonnie's CAS Mix Up Challenge blog . . . it is the second month that this brand new challenge has been running now . . . the time just whizzes past! 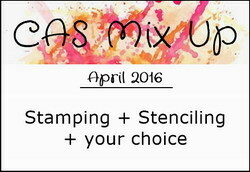 This challenge requires, stamping, stencilling and another medium of your own choice. I will post the pictures here first and then explain how I made it and what techniques/supplies I used after. Here is my card. Lately, I have been playing with some very old materials I have had for donkey's years and I recently found four bottles of Adirondack Alcohol Inks and a bottle of Copper Tattered Angels Glimmer Mist that I have had since I first started card making! Unusual for me to have such a small amount of these products as I usually have to have all of the colours/versions they make of everything . . . I must have been more restrained then (or, more likely, they didn't make so much)? Anywho, I dropped drips of the different alcohol inks over a piece of glossy card-stock, actually, it was glossy photo paper, as I used to do a lot of photography back in the day of 35mm, but that's another story, and I digress. My point is, as glossy photo paper is made for the ink to dry quickly, the alcohol ink didn't have a lot of time to move much, but that was OK by me, because I liked the look of the separate drips, so I just let it dry. Then, as I need glimmer and shine on everything lately, I sprayed it with the copper Glimmer Mist and let that dry. Next, I mounted it to a scalloped panel that I had cut with scalloped rectangle die from Tonic. So, the alcohol inks, was the 'my choice' part of the challenge. 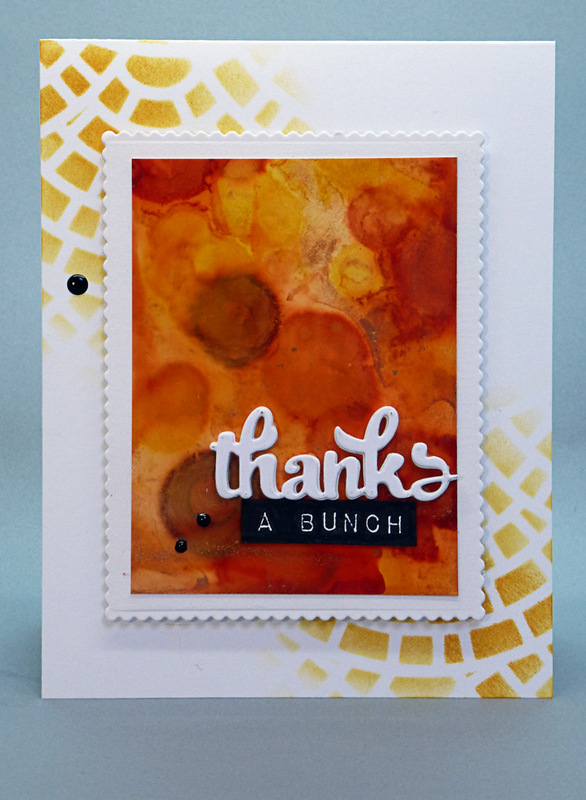 Then, I took a white card base and sponged Dried Marigold Distress Inks on to two, diagonally opposite corners, fading off a little as I went, so this took care of the 'stencilling' part of the challenge. To finish the card, I used a 'thanks' die cut that I had cut out of fun foam and white card-stock and layered for dimension, stamped the other part of the sentiment with, Altenew's 'Label Love' stamp set (one of my go to sentiment sets) and mounted that under the die cut 'thanks' with, thin, foam tape. Finally, to tie in the black part of the sentiment, I used three small drops of black Perlen pen. I am loving this challenge! I hope to see your creations over there too, it really is a lot of fun! Have a wonderful day and thank you for stopping by! What a cool backgrounds, it reminds me of Mars if Mars were sparkley. 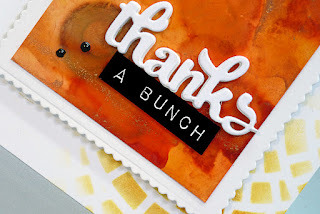 Super fun that you got to use your older supplies, what a great CAS card! So stunning! Beautiful color usage - good for you using your stash of product!! Wow..the panel looks vibrant n fabulous card ! I love, love your card Hazel and I also love these colours. I can see the glimmer here and there and it looks as if you added thin copper paper here and there. Looks amazing. I do have a question, I have no experience with alcohol inks (Yet) just bought my first bottles. But I have heard on a few youtube videos it's best not to use photo paper. Do you know why they say this ? No one tells why not to use this. You certainly can use it Veerle . . . I did here. As mentioned in my post above, it dries quicker than on 'Glossy Cardstock' and so, doesn't allow for as much 'movement' of the ink before it dries . . . I think that is probably why these people have said that, "it's best not too". I hope that helps. Thank you for visiting! Oh, yes, and what you are probably referring to as, "thin, copper paper" is the copper Glimmer Mist! Have a lovely evening! This is gorgeous, Hazel! The alcohol inked piece looks like Monet sunflowers and that bit of stenciling is just enough to set it off perfectly! Thanks so much for sharing this with us at CAS Mix Up! Hazel, this is such a fun and gorgeous card! 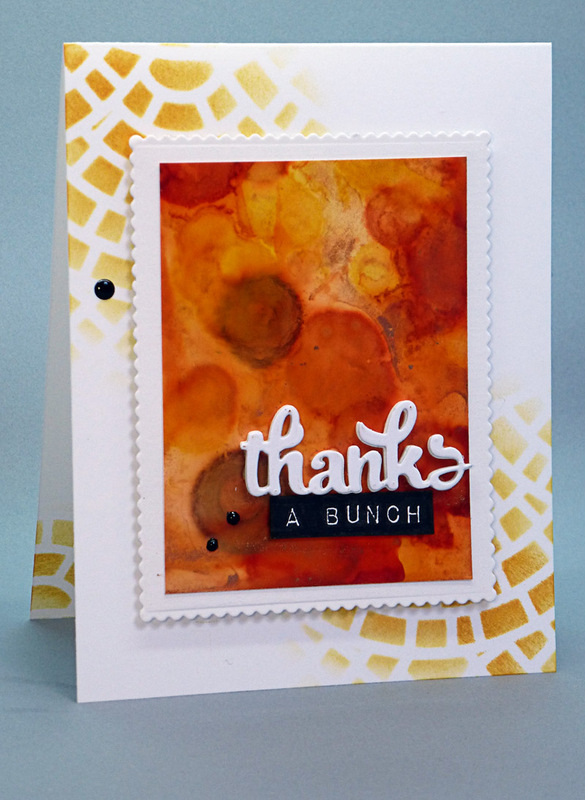 I love the design created by your alcohol inks, and that copper color is so warm and beautiful! Oh, WOW, your focal panel looks amazing, Hazel!!!!! 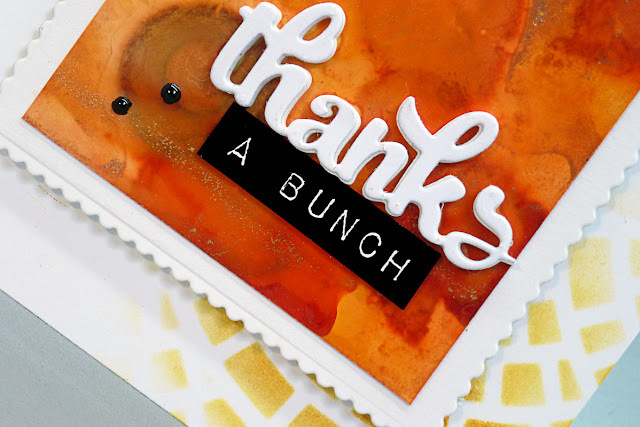 Love what you've done with the alcohol inks, glimmer mist and photo paper - I can just imagine how beautiful this must be IRL!!! The white die cut pops wonderfully against the dark bg and I love the rest of the sentiment in white on black!!! Your scalloped frame is lovely and the stencilling adds a lot to make this a stunning card, my friend!!!!! So beautiful!!! This looks fantastic! Love the background you created with the alcohol inks and the stenciling behind the panel! Have you been tidying up lately and finding hidden 'goodies' along the way, I wonder? CONGRATS on getting an "outstanding entry" win on CAS Mix-Up - well deserved!!!! Beautiful card with wonderful details. 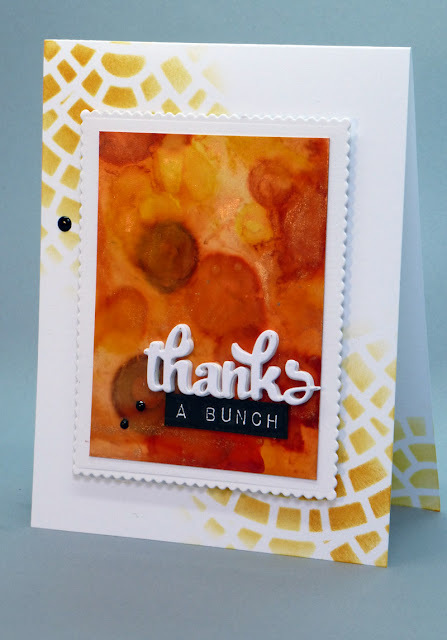 Congrats on your CAS Mix-Up Outstanding Entry.